Select if you're male or female, Put in your height, weight, age & your activity level and then Click the button that says "Tell me How To Lose Weight"
You can eat WHATEVER you want & still lose weight (see why) as long as you're eating -to- calories per day. A cheat day only happens when you eat more than calories. Cheat days are defined by NOT WHAT but HOW MUCH you eat. Use 1 of these tools to track your calories. It does matter what you eat. Not necessarily for overall weight loss, but so people don't become malnourished during the process. Especially if they are exercising and dieting. Eating a bunch of carbs and sugar that amounts to 2000 calories is not the same nutrition as eating protein and veggies that add up to 2000. Protein is even proven to help with weight loss if paired with exercise. Have a quick question. I’m a 48 year old female 5’2” and 103lbs. I’m trying to gain weight but I keep dropping weight. I have ulcers and I’m trying to up my calories but how many do I need to eat to gain weight? Is there a way you can break down how many grams of each nutrients like carbs, cholesterol , protein, good fats, sugars etc. and calories To eat per day. I’m 50 years old, 5’11 and I weigh 250 pounds. I Will Be Down From 200 Then To 153. I weigh 335 pounds and want to lose 3lbs per week. If I stick to 2000 calories a day can I do that? I weigh 140 pounds 5'8 how many calories does a male need? Hi! 52 years old. 5'5". 160#'s. Ever since I had a complete hysterectomy, I've gained weight. I can't eat very much protein without getting stomach pain since my gall bladder was removed. I average about 1,000 calories a day or less. I do Jazzercise twice a week and strength class twice a week. I haven't lost a pound or inches. What do I need to do? On the weight loss calculater it states the activity level and how many times per week do you exercise but how many minutes of exercise do you need to do in one of those times. For example if I exercise 3 to 5 times a week, how many minutes of exercise should I do in one day ?? Hey! I’m 187 and my goal is to lose 30-40 pounds in 3 months. Is this amount obtainable, if so what do I need to do to jumpstart this weightloss? Ok so im 5'2 and 176 pounds im eating 510 calories a day is that bad for me trying to lose weight?? not bad for fat loss but it's probably bad long term b/c you probably wont be able to maintain that super low intake for so long. Hi, I'm a 21 yr old student, weight 155 pounds, and I'm 5'7. 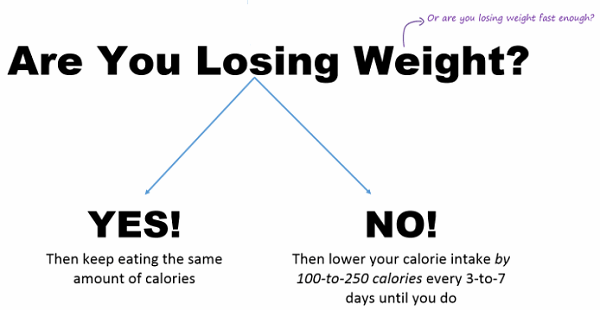 How many calories should I be intaking a day to lose about 10 pounds? Right now I'm trying to keep it under 1400. I just wanted to tell you again how very much you’re appreciated. I had given up hope but doing exactly what you said has caused the 20 pounds I’d gained from PEANUT BUTTER, to fall off:) God Bless you! I'm 13, 5'6 and my weight is between 190-195, im on a healthy diet, but ive been going through a hard time so ive been doing an online school, which means i'm not up and around as much. Is there a few certain exercises i can do at home that are effective in fat loss but wont have me gaining too much muscle mass? Hi! I am almost 49 years old, 220 lbs. I have had 3 children and will be married 24 years in Dec. I want to look good naked!! LOL Although I am constantly moving and running with my kids and cleaning, I would not consider that "active". I have degenerative disc disease in my back which prohibits even walking at times, so I don't exercise anymore. How many calories should I eat to lose weight? Can I have pasta and rice? Oh please help my big self! I am a bit confused. A VLCD is under 1200 calories and it is not recommended to stay on that for an extended amount of time but when I put in my height and weight it tells me I need to eat between 1066 and 1340 cals to loose weight. I am 5’6” 130# and would like to lose 5 to 10#. It roughly takes 1500 calories to maintain my weight so cutting 500 calories a day puts me under 1200. Is 1200 calories really the cut off for all women? Or if you are on the smaller side is it okay to consistently eat 1000 to 1100 calories a day? Hi.. what if I follow your plan to lose weight but I am a 35 year old female with hypothyroidism and pcos ? Will it still work ? I have been trying to lose weight for a long time . I am 5’5 1/2 and 218 pounds. I am losing slowly . Sometimes 2 to 8 ounces a week or sometimes. Even two weeks . I know pcos and hypothyroidism makes everything slower but I’m dratically cutting my calories from over 2500 calories to 1400-1700 cals a day. Should I stick to what I’m doing? I have lost about 5 pounds over the past 2 months . Hello Mr Bryant, I'm 21 years old, 5'4, weigh 140 pounds and I eat 1,200 calories. I exercise three times per week and each work out I burn over 700 calories. I want to get down to 130 pounds, but I continue to gain weight. I don't know what's going on with my body. Should I eat more? or eat less? or just wait it out and see? Nope I don't actually. Haha that may be the case, thanks!! I really like your articles. I weigh 175lbs and soon going to start Jazzercise classes 4 times a week will I lose more than 2 lbs a week if I stick to a under 2100 calorie diet? I also drink ice cold water all day at work. more than likely you will but if not then simply decrease the calorie intake. I’m 68 years old. 5’5” and weight 170. I need to lose 20 pounds in 16 days. Is that possible on counting calories? Can do minimum exercise only. Hi, I’m 66 years and weight 153, I’m eating approx 800-858 cal per per day, walk 1/12 miles a day, how much can I expect to lose per week? Should the water I drink be iced to lose 10 pounds in a week as it says here, or just normal water? 101 ounces of water equals how many liters?